November 17, 2016, 2:39 p.m.
Our latest update on what the public think about Brexit shows that a majority think the government are doing badly at negotiating British exit from the European Union. More than half (52%) think the government are doing badly, just 18% think they are doing well. Both Leave and Remain voters give the thumbs down. 59% of people do, however, still think that Britain will have left the European Union by 2020. 68% of people think that Britain should go ahead with Brexit, unchanged from when we asked the same question in October. People who voted to Remain in June are evenly divided between those who opposed Brexit, but think the government has a duty to implement the decision and leave, and those who would like to see the government ignore or overturn the referendum result. Asked to rank various considerations and aims in Britain’s exit negotiations, the need to respect the referendum result comes top. 45% of respondents put it as their number one consideration (including two-thirds of Leave voters and a quarter of Remain voters). Asked what outcome they would most like to see, remaining in the EU is picked by 31% of people, a “hard Brexit” falling back onto WTO rules is picked by 26%, a Canada style deal by 26%, and EFTA membership by 17%. Continuing EU membership is the first choice of most of those who voted Remain in June, followed by EFTA membership. People who voted to Leave are fairly evenly split between falling back onto WTO rules or a Canadian type deal. Asking more specifically about each types of Brexit, the solution that looks likely to command the widest public confidence is a “Canadian style” trade deal. 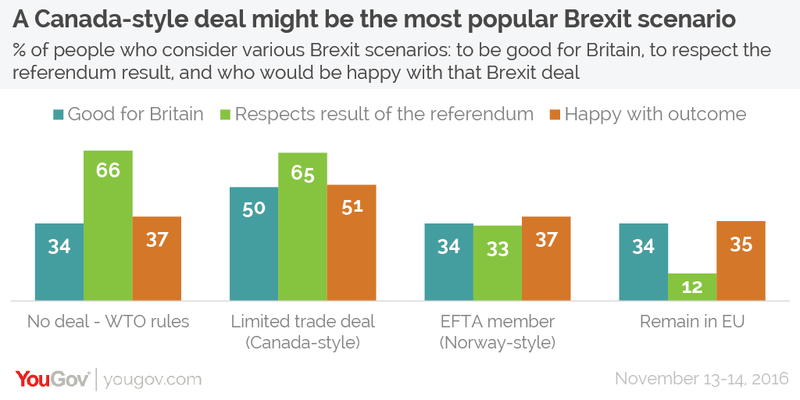 Half of respondents think this would be good for Britain and say they would be happy with the outcome (compared to just over a third for all the other options) and two-thirds of respondents think such an outcome would respect the result if the referendum. By a narrow margin people think it is legitimate for the Courts to rule on whether or not the government has the power to invoke Article 50. 43% think it is legitimate for the Courts to rule on the issue, 39% think they are involving themselves in political matters they should leave alone. However, while they think it is legitimate for the judges to rule on the case, the public don’t agree with the outcome. By 47% to 36% respondents thought that the government should have the right to invoke Article 50 itself, without getting the permission of Parliament. Opinion was strongly correlated to people’s attitudes to Brexit. A large majority of Remain voters thought that it was legitimate for the Courts to intervene and that Parliament should decide. A larger majority of Leave voters thought that the Courts were wrong to make a ruling and that the government should be able to make the decision alone. 59% of respondents think that calls for a second referendum are illegitimate. Individual MPs voting against Brexit is also rejected. 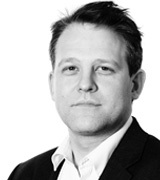 Opponents of Brexit voting only in favour of a “soft Brexit” is seen as a more acceptable approach - 41% of people see it as legitimate, and campaigning for as soft a Brexit as possible is seen as the preferred option by most Remain voters (a majority of Leave voters think politicians opposed to leaving should not voice their concerns at all). What if there is an early election? While only 26% of the public think a call for a second referendum would be illegitimate, that does not mean it is not a plausible electoral policy for smaller parties like the Liberal Democrats who are seeking to increase their support, rather than win an overall majority. We asked respondents to imagine how they would vote if Parliament would not vote in favour of Brexit and there was instead an early election. 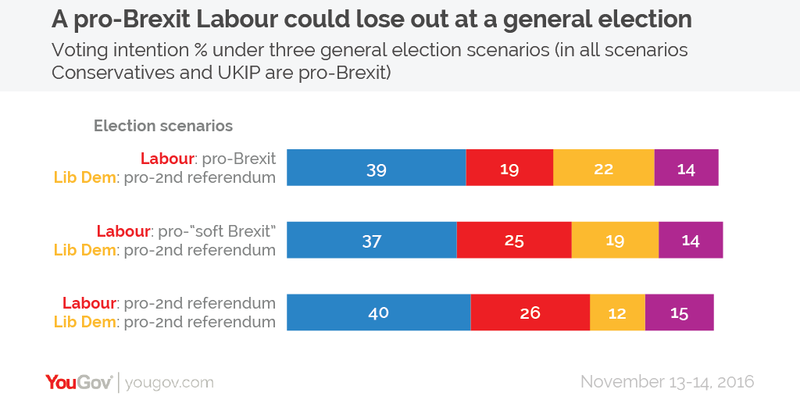 We presented people with three possible scenarios – one where Labour backed Brexit and the Lib Dems a second referendum; one where Labour backed on a soft Brexit and the Lib Dems a second referendum; one where both Labour and the Lib Dems backed a second referendum. In every case the Conservative party would win easily, with a much increased margin and probably with a substantially increased majority. However, in cases where the Liberal Democrats are the only party offering a second referendum they would do very well – increasing their support to 19% or 22%. Hypothetical voting intention questions like this are indicative at the very best – they should be taken with a pinch of salt, and probably vastly over-emphasise the importance of EU policy on people’s votes. Nevertheless, they do suggest that in any early election focused on Brexit there is a substantial upside for the Liberal Democrats. Asked about when the next election should be, a quarter of people would like an immediate election before Article 50 is invoked, 16% would like an election between Article 50 and Britain finally leaving, 40% don’t want an election until after Britain has left. Click the chart&apos;s green title bar to choose which issue you want to explore. Click the blue "By" button on the right of the chart title to choose which data you would like to compare this against. For instance, the below chart shows how well people think the government is handling Brexit, compared against how they voted at the EU referendum.